The University of California, Davis, and nonprofit California Trout provided key results from an in-depth report today detailing the status of 32 types of salmon, steelhead, and trout that are native to California. State of the Salmonids II: Fish in Hot Water offers concerning data about the declining health of these fish populations and opportunities for stabilizing and even recovering many species. The report found that if present trends continue, 74 percent of California’s native salmon, steelhead, and trout species are likely to be extinct in 100 years, and 45 percent could be extinct in 50 years. 45 percent of California’s salmon, steelhead and trout are likely to be extinct in the next 50 years if present trends continue. 74 percent will likely be extinct in the next 100 years if present trends continue. 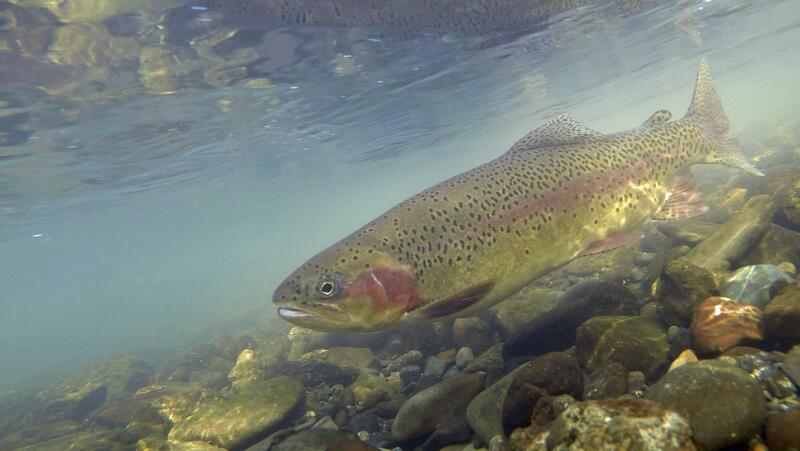 Only coastal rainbow trout have a good chance for survival if present trends continue. The number of species likely to be extinct in 50 years increased 180 percent in the last 10 years — from just 5 in 2008 to 14 today. Of California’s remaining salmon, steelhead and trout, 81 percent are worse off today than in 2008. California will lose more than half (52 percent) of its native anadromous (migratory) salmonids, and over a quarter (27 percent) of its inland salmonids in the next 50 years if present trends continue. SOS II: Fish in Hot Water is the second such report released by CalTrout and the UC Davis Center for Watershed Sciences. The first edition was published in 2008 and established a baseline level of health for each of 32 types of native salmon, steelhead and trout populations in the state, including the extinct bull trout. Since that time, the number of California’s native fish species likely to be extinct within the next five decades nearly tripled, from five to 14 species. And after five years of historic drought, 81 percent of the remaining 31 species are worse off today than they were a decade ago. The report includes an analysis of key threats to the survival of each species, starting with the overarching threat of climate change, which is likely to reduce the availability of cold water habitat that salmon, steelhead and trout all depend on for survival. It also highlights various other human-induced threats, such as dams, agriculture, estuary alteration, urbanization and transportation. The report notes that improving salmonid status throughout California requires investing in productive habitats that promote growth, survival and diversity. CalTrout notes it has developed an action plan to return the state’s salmon, steelhead and trout to resilience to help many of these species thrive. Protecting the most productive river ecosystems remaining in California, such as the Smith and Eel rivers. These strongholds, among others, have the capacity to support diversity and abundance because they retain high-quality habitat and are not heavily influenced by hatcheries, supporting the persistence of wild fish. Restoring function to once productive — but now highly altered — habitats can greatly improve rearing conditions for juvenile fish, especially floodplains, coastal lagoons, estuaries and spring-fed rivers. First, focus on opportunities to mimic natural processes within altered landscapes. For example, off-season farmland can mimic traditional floodplains and support rapid growth of juvenile salmon. Second, prioritize improving fish passage to historical spawning and rearing grounds that have been cut off over time. And pursue strategies that increase genetic diversity of wild fish. A longer, more detailed report from UC Davis Center for Watershed Sciences is expected this summer. Read SOS II’s main findings and explore related online resources. Read California Waterblog post from UC Davis lead authors Peter Moyle and Robb Lusardi. Download images, graphs and charts.